I’ll be appearing at several local events this fall. My two upcoming children’s books are nearing completion, so I hope to have at least one of them ready by mid-October. I WILL keep you updated as soon as I know a firm release date! I’ll have plenty copies of Quentin’s Problem and Fuzzy Buzzy’s Treasure if you haven’t gotten yours yet! 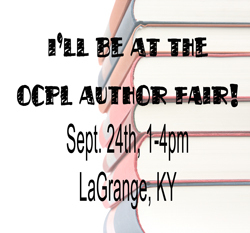 If you’re near Oldham County, KY this Saturday, Sept. 24, come out to the first ever local author fair hosted at the library! I love our library, and am very excited to be able to take part in an event there. This event is FREE to attend! Bring the kids and meet some great local authors of many genres. Coming up on Saturday, October 1st, I’ll be at the Ridgway Memorial Library in Shepherdsville, KY for their FIFTH annual author faire. This is an all day event, from 9 -5. Lots of wonderful authors will be there, including KY Poet Laureate George Ella Lyon, who will lead a workshop (registration required for a guaranteed seat) on using personal memories in your writing. Authors will also be reading from their books, so it’s a great time to hear an excerpt in person! This event and the workshop are FREE to attend! Coming up Oct. 7th – 9th…I’ll be selling books in the expo room with several other authors, filmmakers and artists. The expo room is FREE to the general public. The convention itself is very affordable, at only $65 for the ENTIRE weekend. Kids 12 and under are free! Imaginarium Convention is a three day annual event held in Louisville, Kentucky centered entirely around creative writing, including the worlds of books, movies, gaming, music, and comics/graphic novels. Imaginarium Convention features extensive programming content, with panels and workshops presented by over 150 professional guests covering everything from the craft of writing to various genres, industry-specific topics, publishing, and social media/publicity. The convention features a film festival with a full array of awards, a masquerade/costume contest, live music, gaming, an expo open to the general public, an awards banquet, a series of literary awards called the Imadjinns, and many more activities, creating a welcoming, inclusive atmosphere that is content-rich and ideal for networking, promotion and personal development. < Previous Quentin’s Problem in Midwest Book Review! Next > Dinosaur Zoo Now Available!